This set is part of the baseball comic series of trade cards. 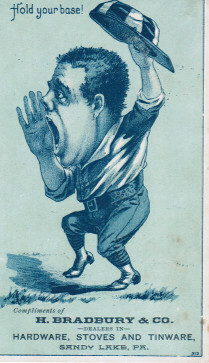 The cards feature a variety of humorous baseball scenes. The set gets its name from the various scenes that depict baseball players with cards having a blueish green tint. Because of that, noted trade card collector Frank Keetz called this the ‘Blueish Green’ set, cataloging it as H804-17. As is the case with most trade cards, these are fragile and printed on thinner card stock. For that reason, they can be torn or ripped quite easily and damaged easier than standard baseball cards. The cards also have a small No. ‘313’ printed in a corner on each card. The trade card is commonly referred to as a late 1800s issue. Some have been found with 1887 schedules on the backs, such as this one. That would appear to date its use to at least that year. It could also, of course, have been used earlier and later as well. Other backs varied. Some, as stated, included advertisements. But in addition to the schedules, others had a baseball theme as well with a blank box score being printed. Many trade cards were used by numerous companies and that is the case with this set. That is in part because it was easier to use artwork that was already produced rather than going through the trouble of creating your own. For that reason, the fronts of the card can be blank with only the picture/caption or include an advertisement for different companies.